Something a little different to what I usually put up here. I have been working on this project for over a year and as some of you may or may not know I am a bit of a rev head. Anyway I thought I would share a bit of Datsun history with you. Its a great story of determination and eventually success. But it was a hard slog with a lot of disappointments and there was also that little problem of war added in as well. The Meiji Period (1868-1912) was a time of rapid industrial and economic development as well as social change in Japan. It emerged from the Tokugawa Era (1603-1868) of isolation of the past 265 years due to ever increasing external pressure by expanding English and American trade routes throughout Asia. The Meiji government brought in thousands of foreign professionals to help Japan modernize just about every part of its economy. In addition to this, thousands of Japanese were sent abroad to England, France, Germany and America to learn technologies from the West. Among one of the first industries developed in Japan was vehicle manufacturing. Until 1911 there had been only 43 vehicles made in Japan, most being prototypes copied from European made cars. There were however over 600 imported vehicles that were registered in Japan. The two major automobile companies in Japan were Ford and General Motors. The Meiji government set low tariffs as an incentive for foreign business to build and invest in Japan which would accelerate the modernization process. On the negative side however, it made it very difficult for small Japanese manufacturers who could not compete in the market with foreign owned companies without financial backing and government subsidies. Foreign brand vehicles dominated the streets of Tokyo and Osaka as sales of Ford and General Motors dominated the industry. The local automotive industry was still struggling to get a foothold in the passenger vehicle market well into the early 30s which lead the Japanese government to encouraged mergers between smaller Japanese owned automobile companies. Nissan Motor Co. Ltd formed as a company in 1934 as a merger between two companies, The Kaishinsha (sometimes spelt as Kwaishinsha) Motor Company which became DAT Jidosha Seizo and the Tobata Casting Company. In 1911 Masujiro Hashimoto established the Kaishinsha Motor Car Works in Tokyo. The factory began making prototype vehicles, importing and repairing foreign cars. Hashimoto was sent to the United States in 1902 by the Japanese government to study steam engine technology. On his return he started his business with 7 employees. The factory made a small passenger car named “Dat car”. The car had 2 cylinders, 10 hp and a top speed of 20 mph (32km/h). Despite regular misconception Kenjiro Den, Rokuro Aoyama and Aketaro Takeuchi did not establish the Datsun brand. The initials of the three gentlemen’s family names (D, A and T) were used by Hashimoto to name his first car honoring his business partners and long time friends for the financial backing of the Kaishinsha Company. 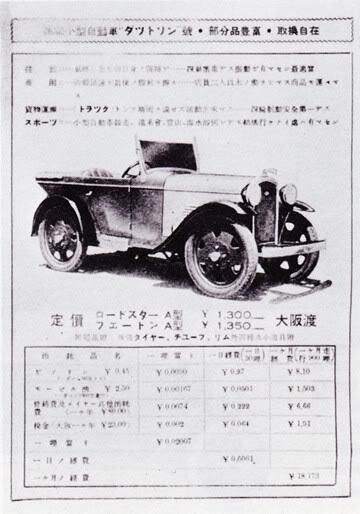 Sales of the new passenger vehicle looked promising after it won 3rd prize at the 1914 Taisho Exposition, however, the sales price of the car was 2000 yen less than the cost to make it and the arduous length of time for government subsidies which took up to 6 years to process was unacceptable as the company struggled to survive. Unfortunately, after 5 years of debt accumulation the Kaishinsha Motor Car Works was liquidated. 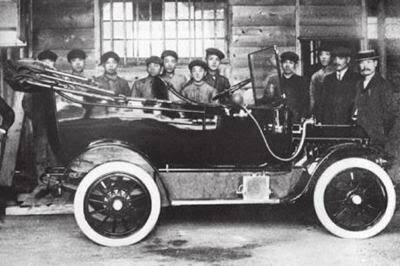 Unfazed, Hashimoto established the DAT Jidosha Shakai in 1925 focusing on military vehicles and small trucks where the demand was greater over regular passenger vehicles. At around the same time in Osaka the Jitsuyo Jidosha Seizo was established lead by company president Gonshiro Kubota which had an American engineer named William Gorham working there. The company was established in 1919, was also making small trucks and an unusual 3 wheeled vehicle designed by Gorham. 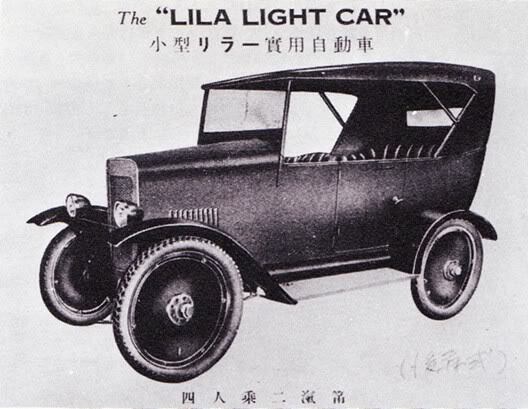 Jitsuyo Jidosha Seizo used Gorham’s connections in America to import Ford and General Motors parts to sell locally but the company was also struggling to produce a vehicle in the lackluster passenger car market. In 1926 DAT Jidosha and Jitsuya Jidosha merged to become DAT Jidosha Seizo (or DAT motors). Gonshiro became the President of the new company based in Osaka and Hashimoto became the Managing Director based in Tokyo. The company quickly began manufacturing 20 vehicles a month, the DAT Type truck and a new Type 61 truck for the army receiving subsidies from the government. DAT Motors met the subsidy quota of 92 military vehicles for 1931 but the factory was underutilized and could increase its vehicle output. The government issued a decree in 1930 allowing people to drive without a license for vehicles with less than 500cc engine capacity and along with the lower government taxes so with its extra capacity DAT Motors began manufacturing mini cars. The third part of the Datsun/Nissan story begins back in 1910. The Tobata Casting Company began making automobile parts for Ford and General Motors and had steadily grown into a successful company. The owner, Yoshisuke Ayukawa, graduated from the Tokyo Imperial University in 1901. Shortly after his graduation he had saved enough money to travel to America. He concealed his university education and went to work in a factory. During his time working in the factory he studied the art of casting. On his return to Japan in 1910 he purchased a foundry and established the Tobata Casting Company Ltd in Kyushu. In 1931 Tobata Casting bought DAT Motors and became Jidosha Seizo Company and in 1933 set up a vehicle manufacturing division within the company. Masujiro Hashimoto resigned from the company and never again had any involvement in the automobile manufacturing industry leaving the business to Yoshisuke Ayukawa. Soon after the merger Ayukawa purchased 66,000m2 of land in Shinkoyasu, now the modern Yokohama plant, as its automobile factory. 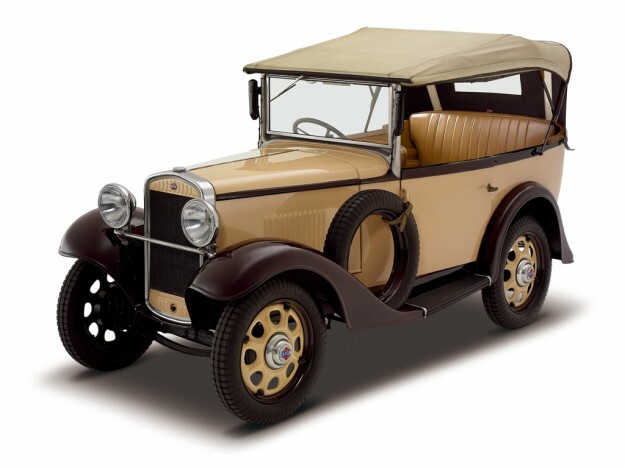 The first passenger vehicle made by the company was the Datsun Model 10 which was released in 1932. It is rumored that the Datsun name was derived from DAT SON, or the son of DAT however, the word ‘son’ meaning disadvantaged was later changed to Datsun. The Datsun Model 10 was competitively priced at 1,150 yen at the time the British Austin Seven was priced at 1,600 yen. 1931 DAT 10, flyer with technical information and pricing. The Nissan Motor Co. Ltd was established in 1934 after the Ishikawajima car company bought the car manufacturing division of Jidosha Seizo. The new company however was not interested in the small Datsun cars and only wanted the facilities to manufacture larger passenger cars. Yoshisuke Ayukawa who was now financed by Nihon Sangyo took the Datsun name and established a new company, Nissan Jidosha (Nissan Car Company) and became Nissan’s first company president. The name Nissan derived from the first two syllables of Nihon Sangyo.